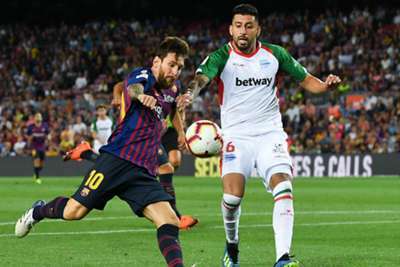 Lionel Messi scored Barcelona's 6000th goal in LaLiga as the champions sealed a 3-0 win over Deportivo Alaves on Saturday. Coutinho was introduced at half-time for full-back Nelson Semedo, but there was little to get the 52,356 fans inside Camp Nou out of their seats until the 64th minute, when Messi sent a free-kick under the wall and into the net. The Argentina star struck the woodwork again despite nearly slipping over in the build-up, before Luis Suarez – making his 200th appearance for the club – was denied by Pacheco when capitalising on a defensive slip. GOAL in @LaLigaEN: Keep them coming! It was fitting that Barca's 6000th goal in the top flight was scored by the man who got their 5000th back in 2009. - Barcelona are the second team in LaLiga history to reach 6000 goals in the competition (6002 goals), after Real Madrid (6041 goals). - Lionel Messi is the first player to score in 15 consecutive LaLiga seasons in the 21st century (385 goals). - Barcelona have scored 6002 goals in LaLiga history, 6.4 per cent of them scored by Lionel Messi (385 goals). - Luis Suarez has equalled Dani Alves as the player with the most assists to Lionel Messi in LaLiga (26 apiece). Next up for Barca is a trip to Real Valladolid next Saturday, the promoted side having held Girona to a 0-0 draw in the first match back in LaLiga.